I love to see children engrossed in a book that I have written. I love to see children laughing out loud in all the places that I hoped they would. I love to capture the hearts and imaginations of children as they identify with the characters in my book. And most of all, I love to see children inspired. Kerry regularly visits schools to talk to children about her journey as an author, and to inspire them with their reading and writing. The talks are unique in that she truly lets children see their potential as she describes how her four young sons are involved in the writing of the books. She will also read some of her first book to the children. Talks generally last around half an hour and can be done for an entire school at once, or split into two smaller groups such as KS1 and KS2. Kerry is always happy to answer questions and sign books at the end. Arrange your visit now by contacting Kerry at kerry@kerrygibb.com. After being contacted by many schools across the UK that were too far to get to in person, Kerry decided to also offer virtual author visits! 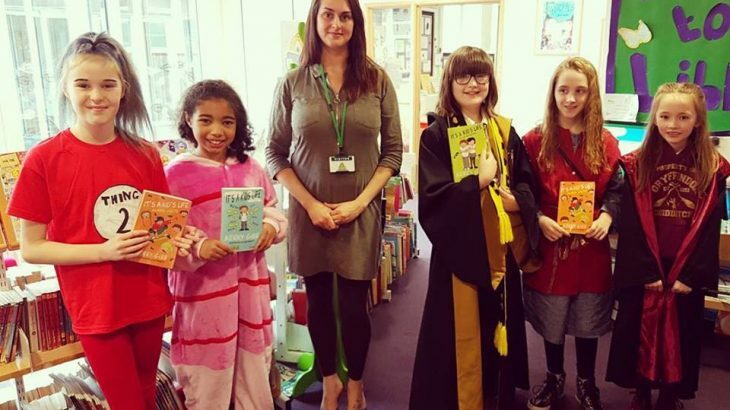 She can now connect with schools in the UK, and worldwide, to deliver her author talk and the children love being able to ask questions face to face this way. Arrange your virtual author visit now by contacting Kerry at kerry@kerrygibb.com. If you have already had an author talk and would like to take the children’s experience further by running a creative writing workshop, Kerry can run an hour long session for you. Within this session, she will demonstrate to the children how she blends real life facts with imagination to write a great story. She then plans a story with the children using this method. It is a fun, interactive session which the children love! Contact Kerry at kerry@kerrygibb.com to discuss further. It's A Kid's Life author talks, schools. permalink. How could you not like Roald Dahl books? You have recently visited our school – thank you so much – the children loved it! We have now written you some thank you letters – do you mind sending me your address so that I may post them off. Thanks so much.